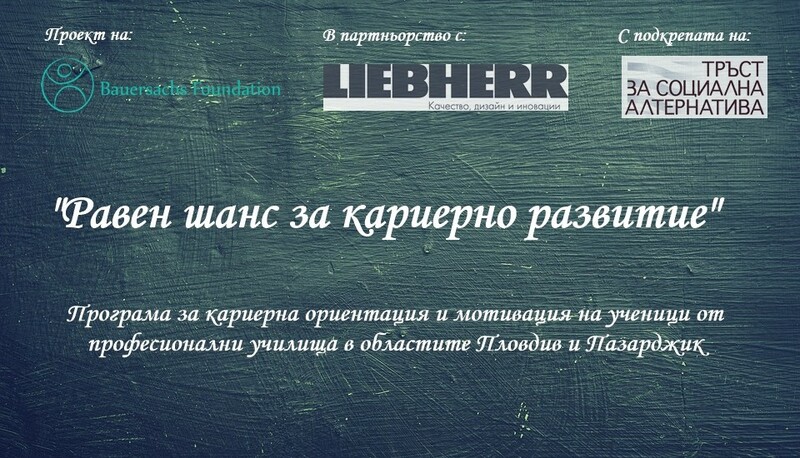 Bauersachs Foundation in partnership with „Liebherr Hausgeraete Marica” LTD launches a program for early career orientation and motivation, aimed at 300 vocational high-school students from Plovdiv and Pazardzhik municipalities. The programs is part of the “Equal chances for career development” project, that is supported by „Trust for social achievement“ . The first part of the program is aimed at the diagnosis of soft skills (social skills) of enrolled students. The diagnosis will be done through through the innovative system Self Awareness, that is certified by the Cambridge University. The diagnosis is accompanied by coaching sessions for students, that aims at raising the awareness of their strengths and social skills. The students will receive guidance on how to apply and develop their soft skills in order to increase their competitiveness in the labor market. Those activities will be conducted during January – April 2017. The second part of the program consists of conducting organized visits to the plant of “Liebherr-Hausgeräte Marica” LTD. Employees of the company will present the variety of career paths for professional development and the necessary competencies and skills demanded by the company. The presentations will be accompanied by a tour of the factory and the students will get acquainted with the real working environment. Groups of 20 students will be formed for the one-day visits.